Adult Bibs, often called Adult Clothing Protectors, help keep body and clothing clean while eating. There are many options to consider when the time comes for an Adult to use a Clothing Protector and this webpage is here to help you find the right choice for your situation and circumstances. Adult Clothing Protectors are usually available in three sizes; 18 by 30, 18 by 34, and 18 by 36. Custom sizing options are often also available. Snap closure bibs typically include snaps on the back flips of the bib to secure it in place; though there are also side snap closure bibs that place the snaps more off-centered and closer to the shoulder. Many bibs include 2 snaps to allow for better neck sizing. Cannot be easily pulled off by the wearer. Holds up better in dryers than Velcro. Not as easy to put on yourself. Snaps can eventually rust over time. Only provides 2 options for neck sizes, may not fit larger necks. Snaps may eventually come loose from the fabric. Velcro closure bibs include strips of Velcro on the back flaps behind the neck to fasten and help keep the bib in place. The strips are typically long enough to be easily adjusted for neck size and fit. More easily put on by yourself. Eliminates the need to fumble with snaps. Velcro strip provides more accurate sizing options based on neck sizes. Lint can collect on the Velcro over time and lower adhesive quality. Can be easily pulled off by wearer. 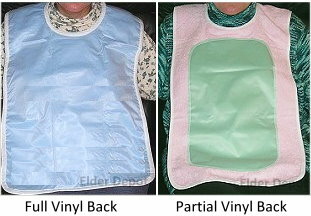 Adult bibs with tie closures include 2 long ties on the back neck of the bib which must be tied, usually by a caregiver. Cannot be pulled off easily. Holds up well in the wash. Requires a 3rd person to put on properly. If not tied properly, can come loose and fall off. If the ties are made from plastic instead of cloth they may cause neck irritation. There are some bibs on the market that include an overlap flap (commonly referred to as self tie, although there are no ties!). These types of bibs include slightly longer flaps in the back of the bib that overlap each other. No ties, snaps, or Velcro that can be damaged. Easily put on by the wearer. Can easily be pulled off. Depending on circumstances can fall off more easily than other types. Bibs made from terry cloth are typically the most common and absorbent type of adult bib, which is the same type of material used in standard hand or bath towels. These bibs are most typically available for adults in white and blue, but may also be available in additional colors, such as yellow or pink. This type of bib includes poly fluff fill in the center of the bib and quilted stitching to help hold the absorbent fluff in place. This bib is available in a wide variety of patterns and designs, which can be more stylish and attractive than a standard terry cloth bib. Adult bibs constructed of flannel/ brushed poly material may be slightly less absorbent than the terry cloth and quilted bibs; however, they are also typically less lightweight, which many users like, and come in a variety of attractive patterns. The lighter weight flannel bibs will typically include a full vinyl barrier sewn onto the back as additional protection. Reusable plastic bibs do not include any absorbency; however, they do offer other advantages that cloth bibs do not. When they are finished being used, you only need to wipe them down with a damp cloth and mild disinfectant and they are ready for use again. It is important to note that Plastic adult bibs should include a full catch pocket at the bottom of the bib to be the most effective. When something is spilled, it will roll down the bib and get caught in the pocket. Without the catch pocket, it could roll down the bib onto the lap! Disposable adult bibs are an option for those that need mild protection. Disposable bibs eliminate the need for laundering as they are generally only used once and then thrown away once soiled (not necessarily an environmentally friendly option). Disposable adult bibs are not usually highly absorbent and may tear easily (dependent on quality). We highly recommend the Plastic Adult bib with Catch Pocket for those that do not wish to launder bibs, as this is a more environmentally friendly option and will save on costs since the same bib can be re-used several times a day, every day! Many of todays adult bibs and clothing protectors include a partial or full waterproof vinyl backing. This is an effective way to ensure that clothing stays clean no matter how much is spilled. Vinyl backed bibs are usually machine washable and dryable for ease of care. All cloth will eventually grow worn and need to be replaced. Tough adult bibs, even those that are machine washable and dryable, will eventually need to be replaced but there are things you can do to help them last longer! Do not use fabric softener, while this makes the bib softer and fluffier it actually reduces its absorption. Always dry bibs on a Low Heat setting to avoid extra wear and tear; air dry when you can. The hotter the water, the more wear and tear on the bib. Wash bibs in Cold Water, modern detergents are designed to clean fabric even without hot water. Launder bibs only when you need to, this will cut back on wear and tear. This webpage is sponsored by the Elder Depot.